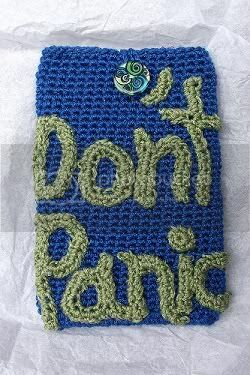 My sister made this case for my Kindle because I named my Kindle "The Hitchhiker's Guide to The Galaxy" because what else would you call an electronic book thingy? So, when I buy an ebook, Amazon asks- "Send to The Hitchhiker's Guide to the Galaxy?" That is so cool! Your sister did a good job on that case too. Very nice. Reminds me of a dice bag my brother made me for Dungeons & Dragons dice many many years ago.